I can't remember when the casts of my throne arrived. I didn't commemorate their arrival with a photo. Without the finished figures to sit upon them, they seemed incomplete. I do remember unwrapping them. I declared the first one unwrapped as Set's throne, the second one unwrapped as Heru-Wer's throne and the third one... Originally I thought it was going to be Djehuty's. 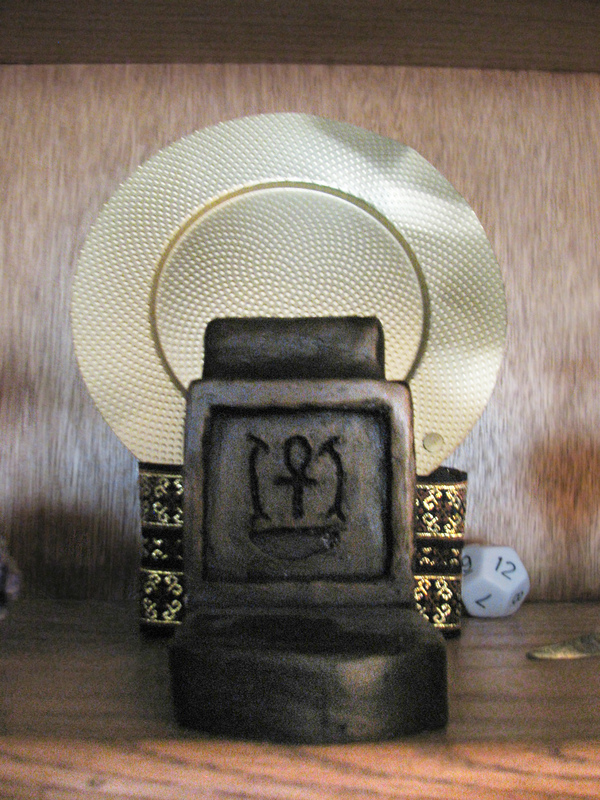 But, after I made the shelf above the Set and Hathor shelf available and put the third throne in place, I got the sense it really belonged to Amun-Ra! Poor Djehuty! Out of luck again! I will need to do something nice for him soon! Meanwhile, I envisioned a golden glow display behind the throne. 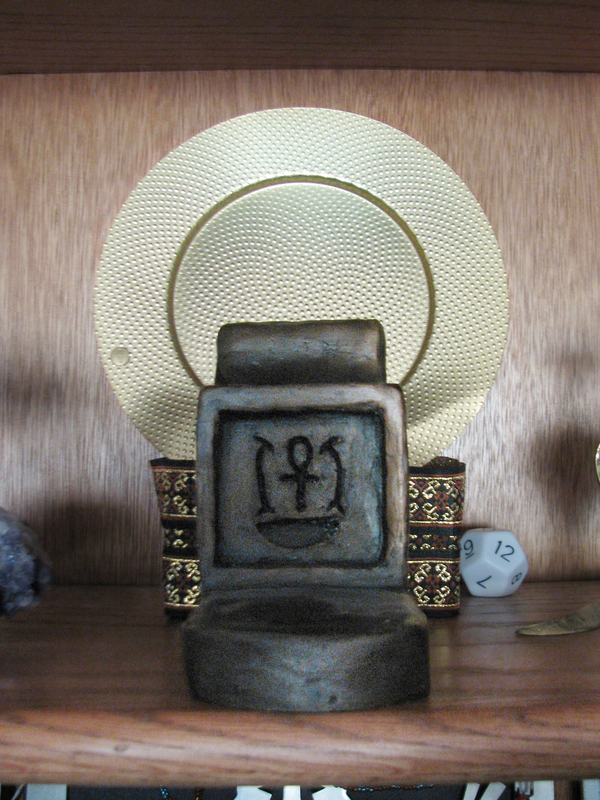 It seemed fitting that no figure be on the throne, as Amun is the "hidden one". Ra, however, is not. I thought I would draw a background. While waiting for inspiration on that, I busied myself with my second attempt at the Hathor needlepoint, and later, two small needlepoints, I saw an ad in my email for what looked to be a perfect backdrop! The plate is advertised as a bottle coaster, and said to be inspired by "Etruscan Granulation". Also the "'grain' arrangement follows a geometric sequence generated by the succession of Fibonacci". Then I tried displaying them less prominently. Surprise! The "warpage" helps the plate to sit more straight up in the stand I made for it. I had to make a stand that would raise the plate high enough to fully look like Amun Ra's rays glowing from a hidden figure sitting on the throne. I produced a lumpy, but serviceable result from the air drying clay. Fortunately, I had enough ribbon left over from covering Wepwawet's base to cover the lumpy stand. Now, my little "Set cookie" sits under protective clear bowl, waiting for me to return to it!